As summer winds down and we welcome autumn, we turn our thoughts to the awesome memories that we made over the summer. Whether you went mountain climbing, sightseeing in a far-away city, or just across town to see some friends, it’s possible that quite a few of your memories involved driving. Today, we’re asking you to share some of your favorite adventures from the open road. Using text, pictures, or video (or a combination thereof! ), tell us all about your favorite road trip memory! The best storytellers will have a chance to test the all-new Roav DashCam S1. With a wide field of view and superior night-vision, DashCam S1 captures every second of your journey, enhancing your future road trip tales. Every sunset, mountain vista, and yes, every bad driver’s license plate will be recorded for posterity. 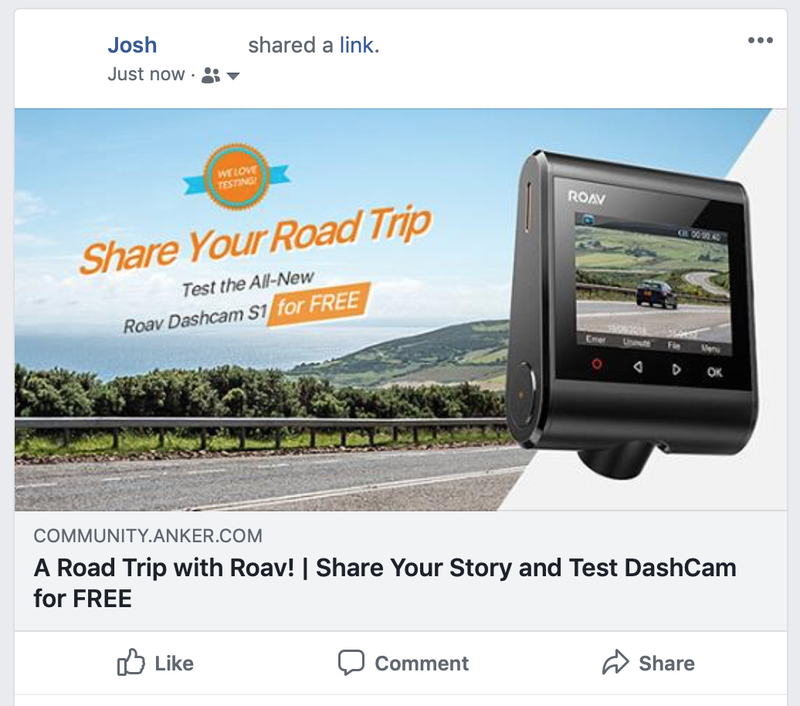 All you have to do is share this event on your Facebook or Twitter, then head to the comments below to share your story, and you’re green-lit to merge onto We-Love-Testing Highway bound for Awesome-Camera Town. Share this event on Facebook or Twitter, and tell us an unforgettable road trip story in the comments below to be entered to win a testing opportunity. This event runs from September 20th through September 30th, 2018. Winners will be announced in the community on October 2nd. 8 testers will be chosen. If you are selected as a DashCam S1 tester, you’ll need to send us a link to your online review within 2 weeks of receiving DashCam. If we don’t get a review from you within this timeframe, you may be disqualified from future We Love Testing events. Where to share your review: You are not required to post your review to a specific website, but you could share your review on social media (Facebook, Twitter, Instagram etc. ), YouTube, community forums, blogs, deal websites, or other online spaces. Roav reserves the right of final explanation. Thank you all for participating in the recent Roav Dashcam S1 testing event. I really enjoyed reading all of your road trip stories and taking a look at the stunning pictures you shared. All the winners will receive a confirmation email this week. After you receive the Roav DashCam S1, please send @AnkerOfficial a link to your review within two weeks. Thanks again to everyone for taking part and stay tuned for more We Love Testing events. So, the Roav S1 is basically a Ravo C1 Pro with lower video resolution? Clark Griswold, wanting to spend more time with his wife Ellen and children Rusty and Audrey, decides to lead the family on a cross-country expedition from the Chicago suburbs to the southern California amusement park Walley World, billed as "America's Favorite Family Fun Park." Ellen wants to fly, but Clark insists on driving, so he can bond with his family. He has ordered a new car in preparation for the trip, but the dealer claims that it will not be ready for six weeks. Clark is forced to accept a Wagon Queen Family Truckster, an ugly, out-sized station wagon, as the car he brought to trade in has already been hauled away and crushed. During the family's travels, they run into numerous mishaps, such as being tagged by vandals in a rundown area of St. Louis, Missouri, while Clark is tantalized numerous times by a beautiful young woman driving a flashy red 1983 Ferrari. They stop in Coolidge, Kansas to visit Ellen's cousin Catherine and her husband Eddie, who foist cranky Aunt Edna and her mean dog Dinky on the Griswolds, asking them to drop her off at her son Norman's home in Phoenix. After stopping at a decrepit and dirty campground in Colorado for the night, Clark forgets to untie Dinky's leash from the bumper before driving off the next morning, killing the dog. A state trooper pulls the Griswolds over and angrily lectures Clark over animal cruelty but accepts Clark's apology; Edna learns of her dog's death and becomes more irate with Clark. Exiting Colorado, Ellen loses her bag which had her credit cards, forcing Clark to have to cash a check for future spending. While Ellen and Clark argue during a drive between Utah and Arizona, they crash and become stranded in the desert. After setting off alone in the desert to look for help, Clark eventually reunites with his family, who have been rescued and taken to a local mechanic. The mechanic extorts the remainder of Clark's cash only to make the car barely operational. Frustrated, they stop at the Grand Canyon; when Clark cannot convince a hotel clerk to cash a personal check because his credit card was reported stolen, he takes cash from the cash register behind the clerk's back and leaves the check. Leaving, they find that Aunt Edna has died in her sleep. They tie the deceased to the roof of the car, wrapped in a tarpaulin. When they reach Norman's home, they discover he is out of town and leave Edna's body at the back door. Having enough of the road-trip and of the mishaps they encountered, Ellen and the children want to go back home, but Clark has become obsessed in reaching Walley World and they continue on. After an argument with Ellen, Clark eventually meets the Ferrari-driving blonde beauty at a hotel and goes skinny-dipping with her in its pool, but they are discovered by the family before anything untowards can transpire. Ellen forgives Clark, and the couple goes skinny-dipping as well. Despite the family's misfortunes, they finally arrive the next day, only to find that the park is closed for the next two weeks for repairs. Finally slipping into madness and realizing that all his efforts have been for nothing, Clark buys a realistic-looking BB gun and demands that park security guard Russ Lasky take them through Walley World; Ellen and the kids follow, attempting to placate Clark. Eventually, an LAPD SWAT team arrives, along with park owner Roy Walley. Roy understands Clark's impassioned longing to achieve the perfect vacation, bringing back memories of his own family's vacation headaches. He decides not to file criminal charges against the Griswolds and lets the family – and the SWAT team – enjoy the park as his guests. 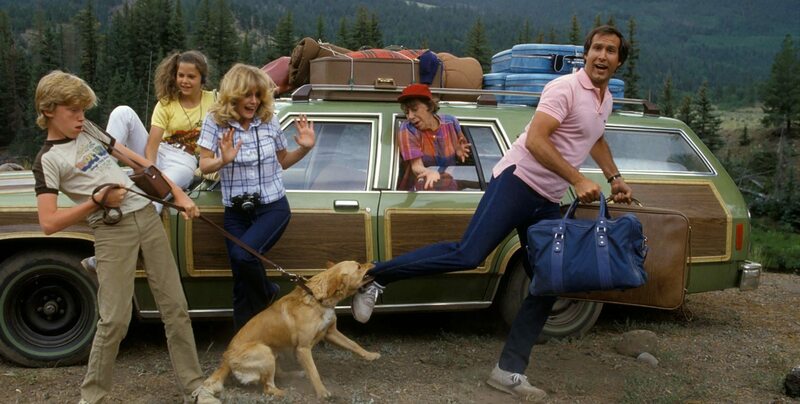 But seriously I wish I had a road trip story that was half as interesting as the Griswold tale. Yes, I know it's nice to get free stuff, but wouldn't it be nice, if the rest of the world got a bigger share of the prizes. Yes, don't read if you don't like a winge..... I've warned you, so don't complain! It seems Europe has been forgotten for months now, when it comes to big buck prizes. Please Anker, remember us. If we don't get prizes, we got nothing to talk about n spread ankers image n quality n guarantee (which is above most companies selling similar items). When I was much younger, my brother's and I used to drive from North Carolina to Michigan to see our grandparents. On one trip, we started driving through the West Virginia mountains, while I was at the wheel. The fog was so thick, I could only see about 10 feet in front of the car. I knew there were at least 4 other cars near us on the road. I slowed down to almost a crawl going up the mountains. It felt like an eternity waiting for the fog to lift as we drove those curvy roads through the mountains. When I was out of college, I went to Killington, Vermont for a ski trip with some friends. When we left, a snow storm came through the area. I was the only one on the road besides the snow plows. It was a long 2 hours to reach the state border and get out of the snow. One last one. In the same car, but not the same trip, as the Killington trip, Chrysler Sebring, I was driving down I-40/I-85 from Greensboro to Raleigh. It had been snowing and some plows had come through. I was in the center lane and I needed to get over to take the exit. As I decided to speed up, in order to put some distance between me and the vehicles behind me. As I changed lanes, the snow and ice was so thick between lanes that I lost traction. I tried to correct the steering, but ended up going backwards down the highway. As I got the car straight, but going backwards, I could see that all the lanes were filled with cars and semi-trucks. I'm sure they were thinking the same thing as I was "Oh ****!". So, I turned the wheel hard, spun around, straightened out, but by that time, the car had stalled. I glided off to the side of the road. Stopped my car, put it in park, restarted and then drove on my way. Last year I went on a long road trip from Florida to Canada for the first time and even my first time out of the country. I wanted to drive so I could experience all the beautiful nature all around and stop at a few tourist shops along the way. Half way through my cars air conditioning went out and needed to be fixed and that was a 2 day hult on our trip as they had to order a part but soon enough we we're back on the road. I really loved the mountains of Tennessee and how beautiful it was to see all the colorful leaves and even saw a bear roaming in the wild. Long story short it was an exciting trip that I would do again. Yes, but the S1 also uses a different sensor (the same one as the C2 Pro), which allows for 60 fps. 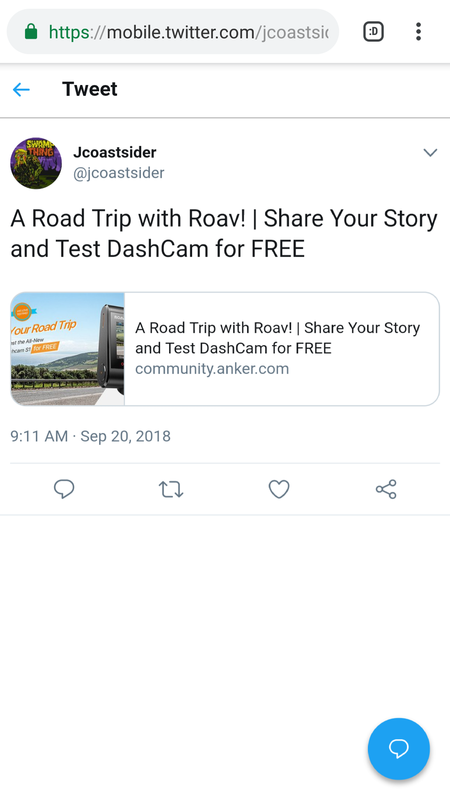 I would love to test out Roav's new DashCam S1! One of my hobbies is going storm chasing during the severe weather season (springtime), and I think this would be a great way to capture the best of my trips! In May of 2016, the Storm Prediction Center based in Norman, Oklahoma issued the first High Risk for the state of Kansas in several years. I asked my dad if we could go storm chasing after school, and he agreed. At first, we weren't sure where to go, as the models were not in great agreement with regards to where the worst of the weather would be (without traveling too far away). To make matters worse, after the first hour, we lost all cell signal. This kinda took the fun out of it because my favorite part was tracking the storms on radar to determine where we should go next. Still, we eventually ran into what appeared to be an impressive squall line. What we weren't aware of at the time is that the storm was actually tornadic and that the National Weather Service had issued a tornado warning. We finally reached within range of cell service, and our phones received the WEA. A couple moments later, we heard the tornado sirens. Although we were not ever able to spot a tornado, it will still an awesome experience and the most fun I've had in a long time! We even witnessed some pretty crazy flooding on our drive back home! Capturing 1080p 60fps video of this experience would have been incredible! Thanks for the opportunity to be selected, @AnkerOfficial! @tiagomota @ndalby @amangons I totally understand and appreciate that you and the many Anker fans from other markets would like to test our new products and help us spread the words. But unfortunately, when we have some new products, they're usually released in the US market first. The reason that many of the testing events are only valid in the US is we're currently unable to ship outside the US. But I will definitely try to strive more benefits for the other markets as well in the future. That was crazy. I'm always scared of driving in the snow day. Wow, a storm chasing sounds exciting! But don't leave the safety behind. Cool photo BTW. That's really a long long road trip. A/C is a must for driving! Lol! Until the end of the whole story that I realized Clark was not you. An interesting story to read though. great giveaways good luck guys! Hilarious bet you thought I was a crazy person until you reached the end of the story. I was hoping to get at least one person. I (we all do) understand US is huge market to hit, and all your efforts go to there first n last. Just would be nice, now n again (maybe twice a year) to make a real effort to start a product outside USA. Maybe then USA will go.... Damn when that thing in Europe coming our way? Which is different to us in Europe continually asking for it.to come here .... Which it rarely does. Oh, what happened to the soundbar you were going to release over here? Got cancelled didn't it, or did it just go straight to USA again?